"With the Vigilance Committee in the East End: A Suspicious Character." The Illustrated London News, 13 Octobris 1888. Epistula From hell: "Mr Lusk—Sir I send you half the kidne I took from one woman prasarved it for you tother piece I fried and ate it was very nise I may send you the bloody knif that took it out if you only wate a whil longer—Signed Catch me when you can Mishter Lusk." Loci primorum septem homicidiorum Cappellae Albae: Osborn Street (dextra media), George Yard (sinistra media), Hanbury Street (summa), Buck's Row (dextra), Berner Street (dextra ima), Quadratum Mitre (sinistra ima), et Dorset Street (sinistra media). Fridericus Abberline, inspector qui casum anno 1888 investigavit. 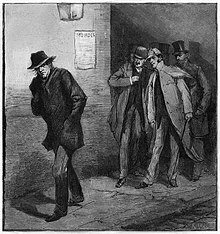 Jack the Ripper ('Iacobus Scissor') est ignotus homicida serialis victimarum muliereum meretricium in regionibus plerumque egentibus egisse generatim habitus, praecipue in et circa Whitechapel districtum Londiniense anno 1888. Nomen Jack the Ripper in quadam epistula ortum est, ab aliquo homicidam se appellans scripta, quae in mediis divulgata erat. Epistula fraus fuisse late putatur, a diurnariis divulgata, ad studium fabulae excitandum et numerum exemplarium diariorum augendum. Homicida intra investigatorios rei fasciculos atque in narrationibus diurnariorum simul editis etiam appellabatur the Whitechapel Murderer ('Homicida Cappellae Albae') et Leather Apron ('Subligar Scorteus'). Begg, Paul. 2003. Jack the Ripper: The Definitive History. Londinii: Pearson Education. ISBN 0-582-50631-X. Begg, Paul. 2006. Jack the Ripper: The Facts. Anova Books. ISBN 1-86105-687-7. Cook, Andrew. 2009. Jack the Ripper. Stroud, Gloucestershire: Amberley Publishing. ISBN 978-1-84868-327-3. Curtis, Lewis Perry. 2001. Jack The Ripper & The London Press. Portu Novo: Yale University Press. ISBN 0-300-08872-8. Eddleston, John J. 2002. Jack the Ripper: An Encyclopedia. Londinii: Metro Books. ISBN 1-84358-046-2. Evans, Stewart P., et Donald Rumbelow. 2006. Jack the Ripper: Scotland Yard Investigates. Stroud, Gloucestershire: Sutton Publishing. ISBN 0-7509-4228-2. Evans, Stewart P., et Keith Skinner. 2000. The Ultimate Jack the Ripper Sourcebook: An Illustrated Encyclopedia. Londinii: Constable and Robinson. ISBN 1-84119-225-2. Evans, Stewart P., et Keith Skinner. 2001. Jack the Ripper: Letters from Hell. Stroud, Gloucestershire: Sutton Publishing. ISBN 0-7509-2549-3. Fido, Martin. 1987. The Crimes, Detection and Death of Jack the Ripper. Londinii: Weidenfeld and Nicolson. ISBN 0-297-79136-2. Marriott, Trevor. 2005. Jack the Ripper: The 21st Century Investigation. Londinii: John Blake. ISBN 1-84454-103-7. Meikle, Denis. 2002. Jack the Ripper: The Murders and the Movies. Ricmondiae Surrey: Reynolds and Hearn Ltd. ISBN 1-903111-32-3. Rivett, Miriam, et Mark Whitehead. 2006. Jack the Ripper. Harpenden, Hertfordshire: Pocket Essentials. ISBN 978-1-904048-69-5. Rumbelow, Donald. 2004. The Complete Jack the Ripper. Fully Revised and Updated. Penguin Books. ISBN 978-0-14-017395-6. Sugden, Philip. 2002. The Complete History of Jack the Ripper. Carroll & Graf Publishers. ISBN 0-7867-0276-1. Werner, Alex, ed. 2008. Jack the Ripper and the East End. Londinii: Chatto & Windus. ISBN 978-0-7011-8247-2. Woods, Paul, et Gavin Baddeley. 2009. Saucy Jack: The Elusive Ripper. Hersham, Surrey: Ian Allan Publishing. ISBN 978-0-7110-3410-5. Vicimedia Communia plura habent quae ad Jack the Ripper spectant. Imaines et epistulae per speciem a Jack the Ripper. Archivum Nationale. Jack the Ripper. Encyclopaedia Britannica. Rossmo, D. K. Jack the Ripper. Center for Geospatial Intelligence and Investigation, Texas State University. Novissima mutatio die 31 Augusti 2018 hora 17:37 facta.